Find a luxurious set of chess pieces of the highest quality using the following reviews and buyer’s guide. If you’ve spent any time at all looking around for a new chess pieces set, you will have noticed that there is an almost infinite variety out there. There are pieces made from plastic, glass, marble, stone, and almost any other material you can think of. There are familiar pieces crafted from standard molds, and there are others that would be unrecognizable as chess pieces if they weren’t sitting on a chessboard! They come in all shapes and sizes, with an overwhelming amount of variety. With all these choices, how is anyone supposed to choose? Size: Chess pieces are available in all different sizes, from tiny little travel sets to giant sets that stand as tall as a person! Most of the time you’ll probably want to buy a standard size set, just make sure to take note of what you’re buying so that you don’t end up surprised! Style: There are several well-respected chess piece styles that are considered traditional. The Staunton pattern is the most popular, and it’s what typically comes to mind when you think of a chess set. This is also the style used in competition. If you want to have a clear, intuitive set where all the pieces are recognizable to everyone, Staunton is the way to go. 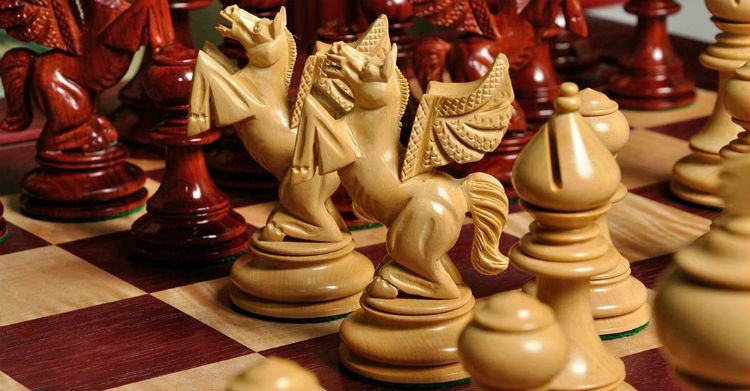 But if you want something more unique, you can find chess pieces that are not even loosely based off of the Staunton pieces, but instead around some other theme, such as surfing or dragons, or anything else under the sun. Material: Plastic pieces are perfect for durability and portability, and they make an excellent starter chess game pieces for a kid who may treat them roughly. 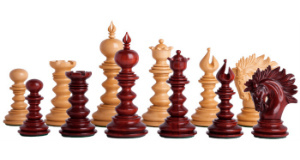 Wood chess pieces are traditional and lend your board a sense of sophistication. Pieces made of marble, crystal, granite, or other such materials lend an air of luxury to your chess table. Pick a material that you like, and that will hold up well for how you intend to use it. Weight: Some pieces come weighted to provide added stability to the pieces and make them more difficult to accidentally knock over. Others don’t. If you can, try out both kinds in person to get a feel for the difference between the two and see which type you prefer to play with. This beautiful set of hand carved chess pieces offers a stunning amount of detail in each carefully crafted figure. It is available in two colors – natural boxwood and genuine ebony, which is a classic black and white look, or natural boxwood and blood rosewood, which makes the black pieces more of a deep red brown color. Both are stunning. The Savano Series Artisan Chess Pieces Set may be purchased with a discounted chess box, and you can choose from maple, mahogany, or red burl for that. You can get a better deal on the matching chessboard and chess box if you buy them along with the Savano chess pieces. We recommend the Fitted Coffer, which is actually built to house these specific pieces perfectly. Unlike many other chess boxes where chess pieces are just piled in on top of each other, this box provides a fitted slot for each piece to keep it protected. This will preserve the beauty of your chess set for many years to come. The pieces are very heavily weighted for maximum stability and will hold up to tons of play. Two extra Queen pieces are also included in the purchase. If you’re looking for a set of chess pieces that will make an impression on anyone who walks into the room with them, look no further. The Anglo-Dutch Reproduction Luxury Wood Chess Pieces are one of the most impressive sets of custom chess pieces for sale today. If you can afford the hefty price tag, you will be rewarded with chess pieces that stand out from the crowd and are totally unique. The design is based on an antique chess piece set dating all the way back to 1800! No one else you know is going to have anything like this, unless all of your friends happen to be collectors of amazing antique chess pieces. Even if that is the case, you have a pretty good shot! The historic Anglo-Dutch design of the chessmen is evident from the delicate carvings on each piece and also the heavily armed Rooks that borrow from the English style of the time. The bishop’s miter is another hallmark of the Anglo-Dutch style. If you can afford the hefty price tag, you will be rewarded with chess pieces that stand out from the crowd and are totally unique. 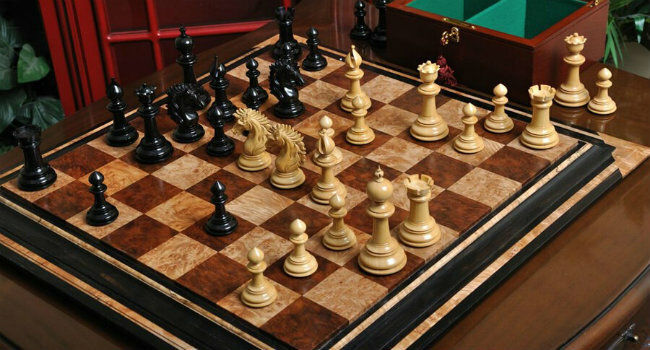 Each piece is carved from the highest quality Antiqued Boxwood and Ebony – which are some of the most luxurious woods on the planet and highly sought after for chess sets. The Anglo-Dutch Luxury Wood Chess Pieces are weighted with unique brass rings around their bases, which add both form and function to the set. The King pieces are 4.75 inches tall, and this set, just like every set that comes from The House of Staunton, includes 2 extra Queens for pawn promotion purposes. The price is steep, but the value is unbeatable. In addition to the luxury antique chess pieces, you may also add a chess board and chess box to your order at a discounted rate. This saves you money compared to buying each component separately, and it also ensures that you have a chessboard to display this unique set of chess pieces that enhances their beauty, rather than detracting from it. If you’re someone who likes to have the best and most unique possessions that no one else has seen before, this is definitely the set for you. This is a high end, luxury chess set that is a very popular choice for chess players who want to own a quality set of chess pieces. It is made of ebony and natural boxwood, polished to a perfect shiny finish. The Camelot Series Artisan Chess Pieces are heavily weighted and finished with a billiard cloth bottom to protect your play surface from scratches. One feature of the weighting system in this set is that each of the pieces are weighted according to their importance, meaning that the King and Queen weigh a lot more than the pawns do. That’s a really neat idea and the attention to detail is what makes this such a great, high-end chess set. The Camelot Series Artisan chess pieces are styled after the Staunton pattern, but the artist has put a little twist on it, adding additional details and making each piece pop while still being part of a harmonious whole. Each set comes with a certificate of authenticity from the manufacturer, along with an engraved registered plaque. Overall, this is one of the best, highest quality sets of chess pieces for sale on the market in 2019. The Magnificent Chess Pieces are so named for a reason. These are the ultimate in luxury chess pieces. They are made of gold and silver plated 24kt brass and maple and walnut woods. They come in two styles – one with the wood parts dipped in gold and silver paint to create a unique marbled finish, and the other with the wood left natural. The Magnificent Chess Pieces are handmade by Italian artists and, with a 5 inch tall King, this set definitely commands attention. The pieces are recognizably modeled after the Staunton pattern, but take significant departures from it as well. The stylistic choices as well as the bright finishes make this a great set of chess pieces for a modern aesthetic. The Magnificent Chess Pieces are so gorgeous you may not even want to play with them! While they would certainly look good as a decorative piece sitting out on a nice chess table, they are durable enough to stand up to years of use. This set makes for a great compromise between the recognizability of standard chess figures and a sleek, modern design. The Empire Series Prestige Chess Pieces breathe new life into a traditional design. Though the pieces are easily recognizable, they do deviate significantly from the traditional Staunton pattern. This would be a great set for someone who loves the luxury and quality of pieces from The House of Staunton, but prefers a slightly more modern or fresh design. The Empire Series Prestige Chess Pieces are strongly inspired by the Art Deco design phenomenon of the 1920s, which lends them both seriousness and elegance. This full sized club set was designed by Frank Camaratta himself and features a 4.4” King. 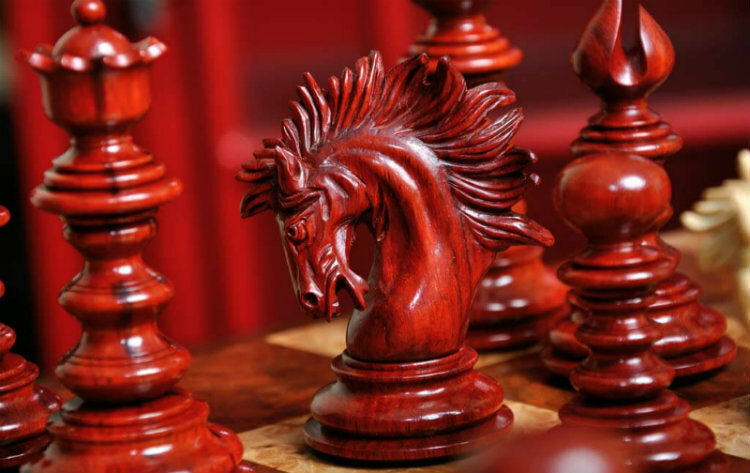 Each chess piece is hand carved from Rosewood and Genuine Ebony, two of the rarest and most luxurious woods on Earth. This whole set screams luxury, right down to the certificate of authenticity, engraved registration plaque, and individual production number that lets you know you have an authentic product. You know a product is good when other people are clamoring to copy it! Despite its high quality materials and luxurious design, you may be surprised to discover how affordable this set is. It’s not inexpensive by any stretch of the imagination, but it’s a great price for the quality that you get, and you can add a chessboard and chess box to your order at a discounted price for extra value. If you’ve been looking for the perfect, highly unique chess pieces that will grab people’s attention and make them just stop and stare, then look no further. The Reykjavik II Series Bone Chess Pieces is that rare set that will catch everyone’s eye with its bright colors and leave them entranced with its unique design and materials. The design of the pieces is a reproduction of one of the most famous chess sets in modern chess history – the pieces used in the legendary 1972 game between Boris Spassky and Bobby Fischer. That match was, of course, held in Rejkyavik, which is where this set gets its name. Many books, movies, and articles have been made in recent years surrounding that match and the lives of the two men who played it. 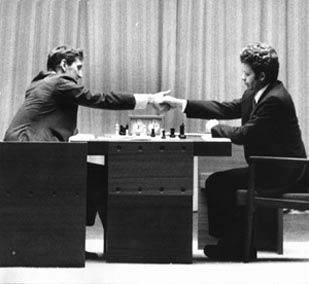 It is widely regarded as one of the single most important moments in chess history. Now, with The Reykjavik II Series Bone Chess Pieces, you can own a little piece of that history and display it in your office or study. This is a full tournament sized chess pieces set with a 3.75” King. It comes in three different color ways. You can choose classic Black and White if you like a traditional, high contrast look. Or you may prefer White and Red for an unmistakable pop of color. For something in between, we love the White and Green version that puts a fresh spin on a traditional design. Be advised, this is no cherry or mahogany set, the red pieces are bright red and not for the faint of heart! As if all that wasn’t enough, these pieces have on more unique feature- they’re made of real bone! The pieces are all carved from the highest grade Camel bone and polished to achieve a perfectly smooth finish. The bottoms of each piece are finished off with a billiard cloth base pad to prevent any scratching. How much would you guess that a genuine bone replica set of chess pieces from one of chess’s most famous games might cost? Well, you may be surprised since these pieces are currently available for a price that’s not bad at all. Get your own unique piece of chess history today! You’ve seen a couple different modern chessmen, but this set offers something completely different – antique chessmen. It’s still a departure on the traditional Staunton style, but in many ways, it feels like it’s a step back into the past rather than the future. Anyone who loves antiques or feels like they were born in the wrong decade is bound to love this set of extraordinary chess pieces. The Biedermeier Series Luxury Chess Pieces are in fact a replica of a set originally made in the Victorian era. This is a rare find, since there are relatively few chess pieces for sale that are representative of this particular period. This design is believed to be first used in the 1830s, and at that time, each chess piece was carved from Boxwood and Ebony – materials that were much more difficult to acquire in that period than they are now. The original set, much like most early chess pieces, were not weighted. Luckily for all serious chess players, Frank Camaratta has worked his magic again to add weights to this replica set without the risk of the Ebony pieces developing hairline cracks. The design of this set was considered quite plain in its time, but now it’s anything but! The unique shape of the pieces, each with their own disc-like bases is quite eye catching for a modern audience. These chess pieces are available at a surprisingly low price that offers a great value for the money, especially if you also add on the matching chessboard and chess box at a discounted price. Of course, this all comes with a certificate of authenticity and an engraved registered plaque as well. The Burnt Zagreb ‘59 Series Chess Pieces are truly one of a kind. Because each set of custom chess pieces is handmade by the artist, no two sets are ever exactly alike. Each piece is incredibly intricate in its detailing. The wood is first turned on a lathe to achieve the timeless look of each piece, then they are carefully carved with a complex and beautiful design. In between turning and carving, the pieces are actually intentionally burned with great care to bring out a natural contrast in the wood’s coloration. White’s army is accented with this charred black color while Black’s army features it prominently, with raw wood details. To finish, The Burnt Zagreb 59′ Chess Pieces are given a clear glossy lacquer to keep them well protected and in good shape for many years to come. This particular set is a tournament size reproduction of a set used at the World Championship Candidates Match held in 1959 in Bied, Zagreb. It was also a popular choice for all sorts of other international chess tournaments that took place throughout the 1950’s and 60’s. A few modifications have been made to the original design, of course, including making the ball finial at the top of the King pieces easily replaceable with a more recognizable Formée cross. The set comes with both pieces, and it’s easy to switch them out whenever you want a change of pace. The Burnt Zagreb ’59 Series Chess Pieces are a tournament size reproduction of a set used at the World Championship Candidates Match held in 1959 in Bied, Zagreb. The set includes 34 chess pieces with two extra Queens for pawn promotion purposes. The King pieces are nearly 4 inches tall with a 1.75 inch diameter base. If you buy them all together, you can get a discount on a chessboard and box to go with this set. For the amount of intricate work and attention to detail that goes into each of these pieces, the set comes at a surprisingly affordable price! This set of chessmen offers a great option for buyers who want a luxury look with a more affordable price tag. It is manufactured by The House of Staunton, which is a well known brand that produces excellent quality chess equipment. You won’t find any cut corners on a House of Staunton set! Additionally, The Camaratta Signature Series Cooke Luxury Chess Pieces was personally designed by the owner and founder of the company, the Maestro, Frank Camaratta himself. The design combines a classic pattern – the Staunton pattern first designed by Nathaniel Cooke, and adds in the signature Knight piece designed by Frank Camaratta. The majority of the pieces are highly detailed and meticulously made replicas of the original Staunton pattern set, with a King piece standing 3.625 inches tall. The Knight piece adds a bit of interest, incorporates Camaratta’s love for Greek architecture, and shows off the intricate details the House of Stunton artists are able to produce. But the most unique thing about these chessmen has to be the wood that they are carved from. In fact, The House of Staunton offers a number of different options to choose from, which is itself a bit unusual, but certainly a welcome break from the ordinary for people who want more control over the final product. Each of the sets come with a Black army made from Genuine Ebony wood, but for White’s army you can choose from Bocote, Natural Boxwood, Lignum Vitae, Mopane, Pernambuc, or Verawood. If you’ve never heard of some of these wood options, that’s to be expected, since they’re typically not used for chess pieces. However, they are all gorgeous and will make the perfect complement to the Ebony pieces, no matter which unique wood that you choose. 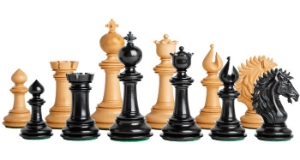 These elegant chess pieces are already offered at a great price for the quality of product that you get, but if you want to rack up even more savings, you can also snag a discounted chessboard and chess box with purchase when you buy the Camaratta Signature Series Cooke Luxury Chess Pieces. These porcelain pieces are among the finest chess pieces for sale in 2019. Each chess piece is carefully handcrafted by the artist Robert Rowley, and you can see his signature on the leather base pad of each individual piece. The Camelot Series Luxury Porcelain Chess Pieces are crafted out of unglazed blue and natural porcelain, with a Gothic sculpture design that includes many unique, stylized details. The King’s robes flow freely as if in the breeze, and a full bodied Knight is pictured on horseback. These larger than life game pieces will certainly add some dramatic flair to your chessboard! This chess pieces set is one of our favorite sets that communicates the regalness and stateliness of the pieces like no other design does. It’s also a good value for the price, especially considering that buyers can get a discount on a chessboard and chess piece storage box when they purchase these luxury porcelain chess board pieces. This is a delicate set that could be easily broken if mistreated, so we do recommend having a dedicated chess piece storage box for it to keep it in good shape for many years to come. This set is another off the beaten path design for a niche crowd. If you’re an American Civil War buff as well as a chess player, this may well be the set for you. The Battle of Gettysburg Themed Chess Pieces Set is based off of the American Civil War and is appropriately colored blue and grey. It features Robert E. Lee and Ulysses S. Grant as the two Kings, with their wives as the Queens. Pawns are foot soldiers, and Rooks are each army’s headquarters on a pedestal swathed in a Union or Confederate flag. Each chess piece is hand painted Oxo-Teak with a remarkable level of detail. The material used for The Battle of Gettysburg chess board pieces is a unique compound made with crushed alabaster that gives the unique feel and look of ivory, but provides superior durability, guaranteeing that these chess pieces will play well and look good for a long, long time. The pieces are padded on the bottom with billiard cloth. These Battle of Gettysburg chess set pieces are uniquely shaped and recommended for use on chessboards with squares of at least 2.5 inches. A chessboard and chess piece box are not included with the purchase, but may be added on when purchasing as a chess set at an additional cost. Your friends will be impressed and delighted when they see this set! This stately chess piece set certainly has a commanding presence on any game board. 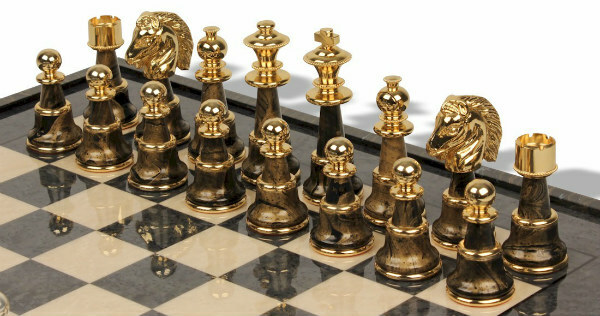 Each chess piece is modeled after Monarchs of the Renaissance era, cast in solid metal. They have a large size and heavy weight befitting of their stately nature, for example, the King stands robust 5 ½ inches tall. 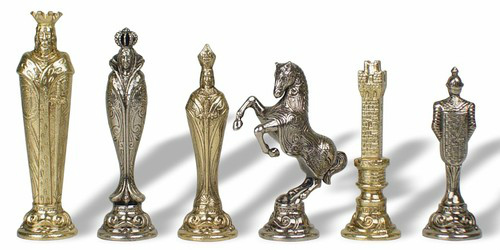 The Large Metal Renaissance Chess Pieces Set is recommended for use on chess boards with 2 inch squares or larger. The metal chess pieces are also available as part of a Chess Set With a Grey Glossy Board that is big enough to easily accommodate the large pieces. We recommend buying the chess set for a better value. The matching chess board complements the pieces really well and makes the large metal renaissance figures look even better on top of it. While these big chess game pieces would still look good on top of any standard black and white chess board, the grey glossy finish seems to bring out the shine and lustre of the metal more. If you want a truly striking piece, spring for the complete set. 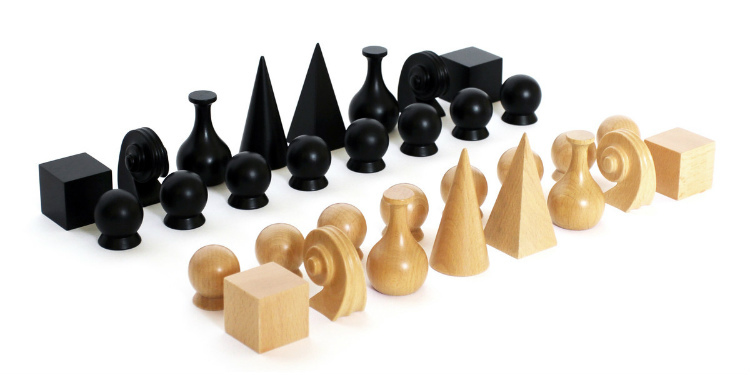 If you’re looking for something even more modern than the Empire Series Prestige set, these Man Ray chess pieces could be right up your alley. This is one of the most unique sets of chess pieces for sale today. Its smooth lines and striking geometric design make The Man Ray Chess Pieces unlike anything else on the market, and a perfect fit for homes or offices with a sleek and modern design aesthetic. Because the set has such a unique look to it, it may be difficult to find a chessboard that suits it off the shelf somewhere. That’s why we recommend buying it with the matching chessboard. It has the high contrast coloration and modern design to perfectly compliment the chess board pieces, rather than distract from it. Both the chessboard and the chess pieces are made from solid Beechwood, and the pieces feature a padded bottom so as to not damage the board during play. But this set of custom chess pieces doesn’t just look good – there’s also a specific meaning behind the design of each of the pieces. For example, the shape of the King pieces evokes the Pyramids, an ancient Egyptian symbol of leadership and the ruling class. The Queen is modeled after the headgear of a medieval monarch, and the Bishops are shaped like flasks due to their history as apothecaries and brew masters. On top of this, the size and volume of each piece is representative of its importance in the game relative to all the other pieces. This is an amazing detail that you won’t find anywhere else! These chess game pieces are more advanced than your average set. They were designed by Daniel Weil, the internationally renowned Pentagram designer and architect. The DGT FIDE Chess Pieces are molded to be a blend of the traditional Staunton style with the proportions of classical Greek architecture. The result of this combination is stunning. 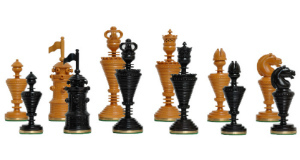 These DGT chess game pieces were first used in the 2013 World Championship Match, when Magnus Carlsen beat Vishwanathan Anand and become the 16th World Chess Champion. The DGT FIDE Chess Pieces are also electronically enabled for use with DGT electronic chess boards and chess computers. To make the most of this set’s features, we recommend using it with The DGT Revelation II, which is the best electronic chess board ever made, as of 2019. With The Full DGT Set, you can analyze your chess games, play against a computer, or even play against real human opponents over the internet. Even without the board, though, these modern chess pieces are a joy to play with. The DGT Revelation II typically comes bundled with a different set of chess pieces, but it is possible to get the FIDE chess pieces included with it instead of the other pieces at a better price than buying them both separately. Chess pieces are available in all sizes to accommodate all sizes of chessboards. Most sets will have a recommended board size that acts as a guideline for the buyer. If you already have a chessboard that you intend to use with your new chess board pieces, rather than buying a new one that matches the set, make sure to measure the squares of that board and follow the manufacturer’s recommendation. If you have a chessboard with 1.5 inch squares, don’t buy a set of chess pieces recommended for boards with 2.5 inch squares. That is a recipe for disappointment and an extremely cramped chessboard during games, if you’re even able to play at all. You may be able to get away with a difference of half an inch or so, but it’s always best to follow the manufacturer’s recommendations as closely as possible. If you don’t, you may find yourself unexpectedly shelling out for a new, appropriately sized chessboard to accommodate your new custom chess pieces. It will save you money in the long run to buy chess game pieces that fit with your current chessboard, or to buy a chess piece bundle that includes its own matching chessboard. There is an almost infinite variety when it comes to chess piece styles. Of course the most popular and recognizable is the Staunton style, but on this list alone, we’ve seen sets themed around Medieval monarchs, and Civil War figures. That’s not even scratching the tip of the iceberg! Whatever your style is, whether it be traditional, modern, simplistic, futuristic, or anything in between, there is a chess piece set out there for you, we guarantee it. Just make sure to consider when you’re buying a chess pieces set that’s more “out there,” many people won’t be able to immediately recognize each piece as they would with a more standard set. Consider whether that presents a problem for you, for example if you regularly play with friends or students. These unique sets are also typically not allowed in competitive play, so if you plan to enter any competitions, make sure you at least have a “normal” set on hand. Another thing to consider when choosing a chess piece style is whether it will complement any chess accessories you currently have. Maybe it’s not a big deal to you if your pieces don’t match your chess clock, but you’ll want them to at least not clash with the chess board or chess table you regularly use. Two beautiful accessories individually can still make an eyesore when placed together, so give it some thought. 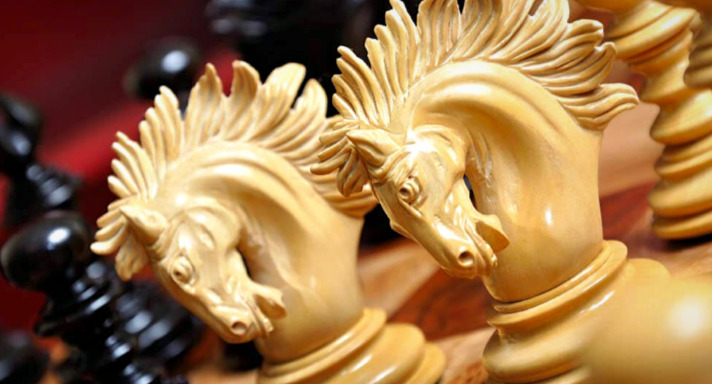 Chess board pieces are available in all manner of materials, from ancient mammoth ivory to natural stone to plastic. Each material has its own unique look and list of pros and cons, so just pick the one that you’re most drawn to. Plastic sets are cheap and durable, but often lacking in sophistication, detail, and elegance. Marble chess pieces are gorgeous and luxurious, but sometimes improperly weighted and difficult to play seriously with. Wood sets are traditional and elegant, but some require special care. You don’t need to choose chess pieces that are made from the same material as your chess board or chess table, but you may find that you prefer that type of cohesive look. Our advice is to find a set you like and take into account its material, rather than decided on a material first and going from there. You’ll miss out on a lot of great chess sets that way, and material often doesn’t make as much difference as other design factors like how well it’s designed, weighted, and manufactured. We recommend choosing a chess piece set that is weighted for balance, either naturally or artificially. For regular play, weighted sets are best. Most chess pieces are weighted with lead discs tucked inside the base of each piece, though some employ more unique weighting systems, such as a decorative brass disc affixed to the bottom of each piece. Other materials, like marble, are naturally well balanced and often do not require additional artificial weighting. The best way to test out the weight of chess set pieces is to find them in a physical store and handle them, or find someone who owns them and would let you check them out. Then, you can buy with confidence online. Think about how you intend to use your new chess pieces. Will it be in constant play everyday, only see occasional use, or is it going to be a purely decorative item? This will determine what kind of durability is necessary and, to a certain degree, what material you’ll need to buy. Plastic and wood are among the most durable of materials that can take lots of wear and tear. They are difficult to break, even when dropped to the ground or accidentally stepped on. This makes them a great choice for kids, frequent transportation, or the very clumsy chess player. Glass and porcelain are among the most delicate materials. They can be used for everyday play, but they need to be treated lightly and cared for responsibly. These are best for home use by adults, and they should always be stored in a protective chess box when not in use. And then there’s everything in between. Many materials can stand up to rigorous use without breaking, but still may appreciate a little bit of time off or extra care now and then. Make sure to look into the maintenance requirements of any chess game pieces set you’re considering – whether the wood will need refinishing or the metal repolishing, etc. If you still didn’t find what you’re looking for, there is a wider selection of beautiful chess pieces out there. And of course there is the matter of cost. If you’re on a tight budget, a handcrafted set may be out of reach for the time being. Don’t waste time ogling them, but turn your attention toward the many wonderful mass manufactured chess set pieces that are for sale in 2019. They are getting more and more stylish by the day. You should be able to find something that you like without breaking the bank relatively easily, if you don’t get your hopes up by first looking at custom chess pieces that are far out of your price range. That’s really all there is to it! The main things you’ll need to consider when choosing new chess board pieces if the frequency with which they’ll be used and the level of care they’ll be treated to. Knowing this, you can find a durable or delicate, low maintenance, or precious set according to your needs. Just be honest with yourself and you’ll be able to find something that suits your needs. Chess Clocks – Spoil yourself with a new chess clock in addition to your new chess pieces. Chessboards – Get pro by matching a new chess board to your new chess pieces. Chess Tables – We recommend you to buy a chess table that suits your new chess pieces set. Online Chess Store – Our reviews of the best online chess stores of 2019.